The LUMI professional HPAR90 is a hybrid high performance battery powered 9X12W RGBW 4IN1 LED par lighting fixture. The compact design and battery powered feature makes it a very versatile light for indoor and outdoor applications as it can be freely moved around with no concern for accessible power or cabling, however, the HPAR can also be used as a wired par if desired. The LUMI professional NUKE9 is an ultra bright LED RGBW flood / blinder / strobe. 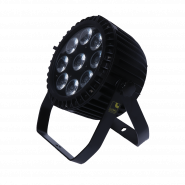 With a face made up of 1320 0.6W RGB LEDs, it boasts a high power output as a strobe or wash fixture. The NUKE9 is a multi purpose fixture perfect for permanent installation and rugged enough for mobile production use with an IP65 rating.